The Reviews: Weepies are a common movie fare in the Philippines, along with extremely violent action thrillers and trite youth comedies. 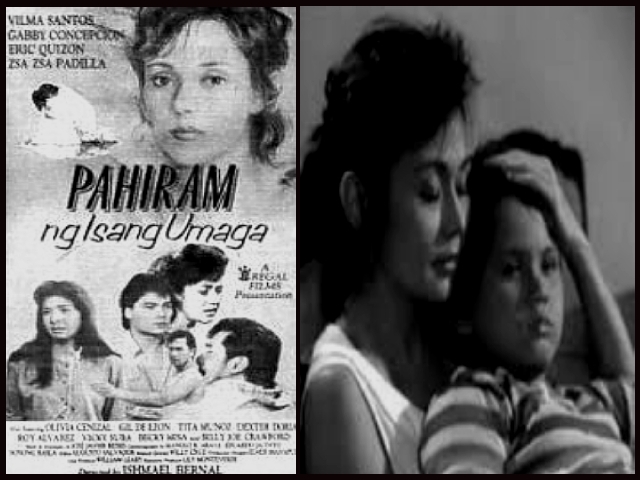 It is, therefore, a cause for cheer when a filmmaker tries to elevate the very common genre of the melodrama into a rich and intellectually rewarding film experience, such as director Ishmael Bernal has done with his Pahiram ng Isang Umaga. Director Ishmael Bernal has seen in the material an opportunity to put substance to what has often been denigrated as the unthinking man’s entertainment, and to a considerable degree, his attempt has been a success. Pahiram is both effective as a tearjerker and meaningful as a depiction of people in crisis. Using a traditional element of the genre, the theme of death, Bernal and writer Jose Javier Reyes probe into the life of a woman who has been told that the end is near. Juliet (Vilma Santos, one of the two reigning Philippine female superstars for the past two decades now) is told that she has eight or maybe seven months to live. As a progressive advertising creative director who has been promoted (rather late) as vice president of her company, she has the means to attend to the less mundane demands of life, examine what may have been an unexamined life, and make the most of the limited time left. In all these, Bernal explores the emotional and psychological condition of the person who lives on borrowed time. Naturally visible here are the many symbols not only of death but also of life to serve as some kind of counterpoint or irony. Sometimes, they blend with each other, and at other times, they contradict. From the peasants’ ritualistic rice planting to the backyard harvesting of sun-dried patola cultivated as life-giving seedlings, the evidence of life renewing itself could hardly be ignored. Then there are the more obvious symbols of fire, daybreak and persistent rains (the latter of which are used to reinforce the gloomier mood at the second half of the movie, and also suggest the rains’ refreshing and replenishing results). But the most eloquent symbol here of life is the process of artistic creation, personified – again paradoxically – by the expressionist painter Ariel who befriends and then is smitten by Juliet. There are ironies here. The painter creates life through his art, but at the same time, psychologically tormented, he wants to end his own life. Such a restless, free soul, grappling with the complexities of life, he has a whole life ahead of him, his artistic world limited only by his imagination, and yet he wants to quit. In contrast, Juliet who is dying, wants to live. Here is a woman who saves a man’s life (the artist’s) but cannot save her own. The idea of art as life or art vs. life is examined at length. Asked by the boy why he has to put on canvas the seascape, the artist makes the clarification that he is not copying the scenery. Ostensibly, he is recreating it on a different plane, art being something else, with a life of its own. This is suggested by the portrait the artist is making of Juliet. The model may soon die, as she will, but the portrait will live on. Life may indeed be short, an idea which used to be stated directly in previous Bernal movies, but art endures. It is the one thing in this world which is eternal. The briefness of life is suggested with the graphic sight of wet sand dripping down from the hand. Bernal and Reyes go farther by including a scene in which the artist explains the origins of art. By the fireside at the beach, and watching the flame cast a glow on them, he notes that prehistoric men “discovered” art when they made outlines of shadows on the caves. Those artworks, though crude and primitive, still exist. Implicitly, Juliet’s death, no matter how saddening, is not going to be the end. Philosophical musings like these are not standard soap opera fare, and may alienate a lot of ordinary moviegoers (even the more cerebral ones who cannot accept the conventions of the soap opera genre). Woven unobtrusively into the plot, however, they add texture and enrich the drama. Juliet in a way will continue to live – in that portrait, in her young son who will survive her and hopefully continue her legacy whatever it may be, and in her good deeds. In the last scene, the imagery and symbolisms of life and death abound. Juliet dies at the break of dawn, the start of a new day (and life), but not without first making her last sentimental paean to life. Supported by the artist, her eyesight having failed completely and with the waves caressing their feet, the weak and dying cancer victim remarks how beautiful life is. 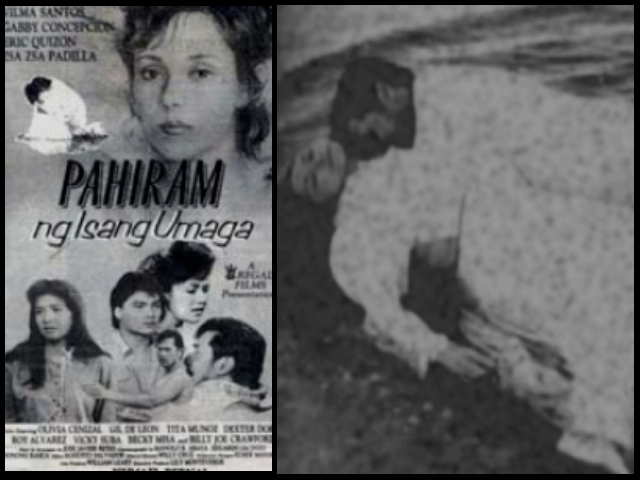 This entry was posted in ARTICLES, FILM REVIEW and tagged Eric Quizon, FILM REVIEW, Ishmael Bernal, Pahiram Ng Isang Umaga (1989), philippine movies, Vilma Santos, Vilma Tuazon, Zsa Zsa Padilla. Bookmark the permalink.